The life expectancy at birth of the Bulgarian population in 2013 – 2014 was 74.5 years, down by 0.02 years compared to 2012 – 2014, the National Statistical Institute (NSI) said on May 13. Bulgaria has one of the lowest life expectancies among European Union member countries, with only Latvia and Lithuania lower, the NSI said. The highest life expectancy in the EU is in Spain, 83.3 years. Bulgarian women continue to be able to expect to live longer than Bulgarian men, going by the NSI figures. For Bulgarian men, life expectancy at birth is 71.1 years, while for women it is 6.9 years higher, 78 years. The NSI said that between 2005 and 2015, Bulgarians’ life expectancy at birth increased by two years for both men and women. 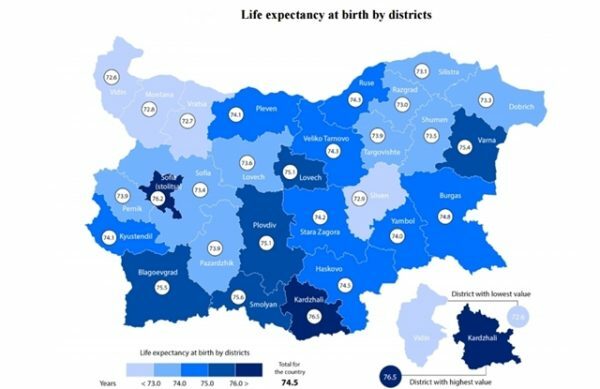 The life expectancy of Bulgarians living in cities, 75.3 years, was 2.7 years higher than that of people living in rural areas, which was 72.6 years, the NSI said. The life expectancy of the urban population had gone up by 2.4 years since 2005, but for the rural population, it remained the same. A Bulgarian aged 65 years may expect to live a further 16 years, but there is a gender difference. Men aged 65 have a further life expectancy of 14.1 years, while for women, the figure is 17.5 years. In the decade between 2005 and 2015, the life expectancy of 65-year-old Bulgarians increased by 1.4 years, one year for a man and 1.2 years for a woman, according to the NSI. There are regional differences in life expectancy, from 72.6 years in the Vidin district to 76.5 in the district of Kurdzhali. Life expectancy is higher than the country average in nine districts. Women live longer than men in all country districts, but the difference between sexes is highest in the districts of Vratsa (8.3) and Montana (eight years), and the lowest in the Kurdzhali district, six years, according to the NSI.